Sandro Botticelli followed his own conviction when he chose his career as a painter. The same "inner voice" guided him when he created pictures with unsurpassed poetic beauty. Sandro Botticelli's birth name was Alessandro di Mariano Filipepi. Though he was well educated, he wasn't interested in reading and calculus. His father put him in training with the goldsmith Botticelli. But Sandro wanted to be a painter, and became an apprentice with Fra Filippo Lippi. 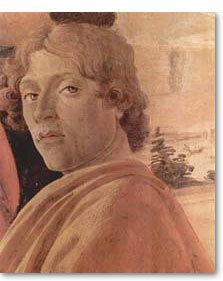 Botticelli was twenty years old when he came to Fra Filippo. But the religious motives of his teacher did not dominate his work. As a painter he was a dreamer and a poet. Botticelli was a skillful draughtsman. He wanted the lines to be meaningful and the people to be beautiful; sometimes this meant that he sacrificed an anatomically correct representation of the human body for the sake of linear rhythm and grace. He wanted to get an idea through, and this was more important to him than depicting people in three dimensional surroundings. As a result his paintings are thought-provoking and poetic, as well as decorative. By 1470 Botticelli had his own workshop, he was then 25 years old. At the age of 36 he was summoned by Pope Sixtus IV to fresco the walls of the Sistine Chapel. He went on to work on frescoes in Tuscany and Florence. His paintings were well received in Florence during the second half of the fifteenth century. Sandro Botticelli's most famous works are Primavera (ca 1482) and The Birth of Venus (ca 1485), both picturing scenes from antique mythology. These are among the masterpieces of the Early Renaissance. Mythology was a common theme for Botticelli; it suited his desire to render divine beauty to the characters he depicted. But he also painted religious motives, and they were also performed in his special manner with clear contours and a sort of "two-dimensional" perfection. In 1494 the Dominican priest Girolamo Savonarola became leader of Florence. He preached a humble living in an oppressing way, depriving people of all worldly means of enjoyment; this included mirrors, cosmetics, gaming tables, musical instruments, books, pictures and sculptures. Savaranola had all items he disapproved of collected from the town population, after which he burned everything in the famous Bonfire of the Vanities. Sandro Botticelli, who had become a follower of Savaranola, is said to have thrown some of his own paintings into the fire himself. Savaranola was executed in 1498. After 1500 Botticelli was less employed, and his work changed in character; his paintings became smaller and retrospective. He had trouble adapting to the social and political turmoil in Florence that followed on the fall of Savaranola. Botticelli never married. Some believe that he was homosexual, but the popular view is that he suffered from unrequited love for a married noblewoman. It has been claimed that she served as a model in several of his paintings, among them The Birth of Venus. When Sandro Botticelli died in 1510, he was buried at her feet in the Church of Ognissanti in Florence, according to his wish. For many years Botticelli's work was almost forgotten, until he was rediscovered around 1900. Today his paintings are, of course, indispensable when one reflects on the beauty and grace of Early Renaissance art.